On Thursday, September 6 through Saturday, September 8, 2018, fourteen leading scholars will share their knowledge and current research on the life and impact of Sir Walter Raleigh (1554?-1618). 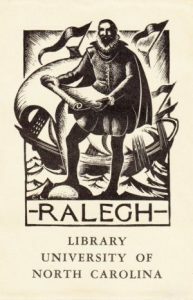 Raleigh 400: A Conference on Sir Walter Raleigh Four Hundred Years After His Death will be held at the Wilson Special Collections Library, part of the University Libraries on the campus of the University of North Carolina at Chapel Hill. The conference is open to the public but will be geared toward a scholarly audience. Advance registration is required. Admission is free, with the exception of the dinner and talk on Friday evening, September 7. The conference is sponsored by the Wilson Special Collections Library’s North Carolina Collection and Rare Book Collection and the Program in Medieval and Early Modern Studies at the University of North Carolina at Chapel Hill. Questions: Please call the North Carolina Collection at 919-962-1172.